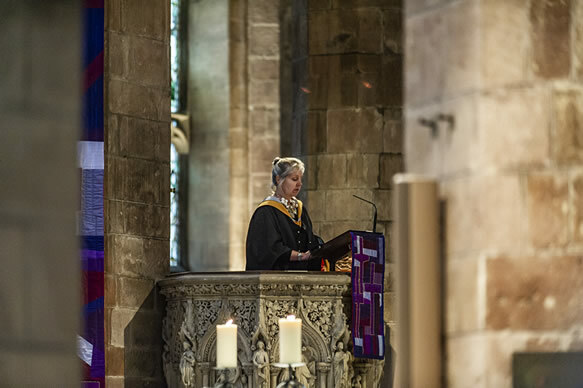 Dollar Academy’s year of Bicentenary Celebrations continued on Wednesday 13 March with two Services of Thanksgiving in the heart of Edinburgh at the iconic St Giles’ Cathedral. Two hundred and fifty choristers and instrumentalists, from Prep 4 to Form VI, filled the stillness of the cathedral with a rich programme of music including Handel’s Zadok the Priest and Hallelujah Chorus, Rutter’s O be Joyful in the Lord, Papoulis’ Give us Hope and a specially commissioned piece for the Bicentenary, Missa Brevis, composed by FP Euan Stevenson. The musical pieces were complemented by poetry, drama and readings with the centre piece being an original reflection on founder John McNabb’s life and legacy – The Captain Comes Home, written by Deputy Rector Geoff Daniel. A fleet of 13 buses transported more than 500 pupils from Dollar to Edinburgh to take part in the Service – their voices swelled those of the choirs in the communal hymns and they listened attentively to addresses from the Rector, the Chair, Prof. Jim McEwen, teacher, FP and parent Nicola Letford and Minister Rev Dr Liam Fraser, Chaplain of Edinburgh University. His theme of service and gratitude resonated with all gathered for the afternoon service and subsequent evening service before a congregation of parents, FPs and friends of the Academy.